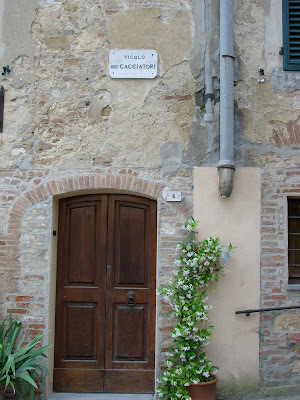 If I had to choose just one place from this last trip to visit again, it would be Tuscany. Spectacular scenery, delicious foods, world class wines and a laid back attitude so appealed to me. 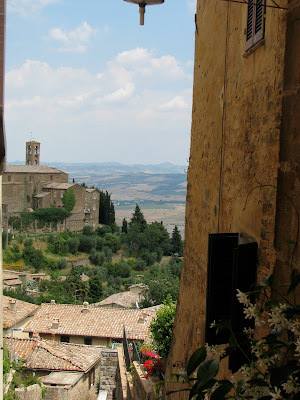 Our first stop in Tuscany was Montalcino. We parked the Cinquecento outside the city walls and walked in. 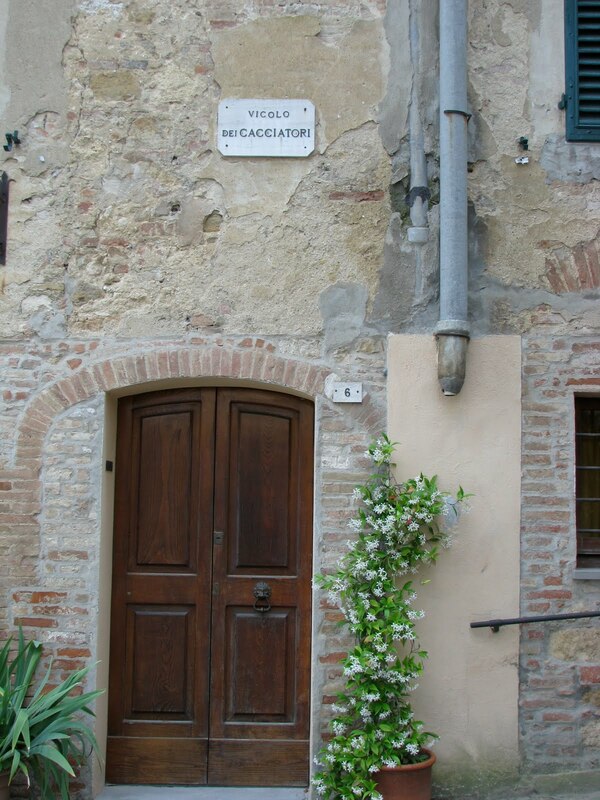 (In most of the tiny Tuscan towns, only residents are allowed to drive in the town itself). We had lunch at a spot recommended by our guru Rick Steves, and of course, we were not disappointed! Anchovies with pesto, local pecorino cheese served melted with honey, gnocchi and a delicious salad. Very yum! We drove on to our agritourismo, just outside of Pienza. Podere Poderuccio is a working farm with 4 beautifully appointed and modern villas for tourists. For just 60 euro, we had our own air conditioned apartment with a kitchen. Wow! This is a shot of the outside of the villa. Erika, the agritourismo proprietor, wasn't quite ready for our arrival, so we drove into the next hill town over to spend the afternoon. 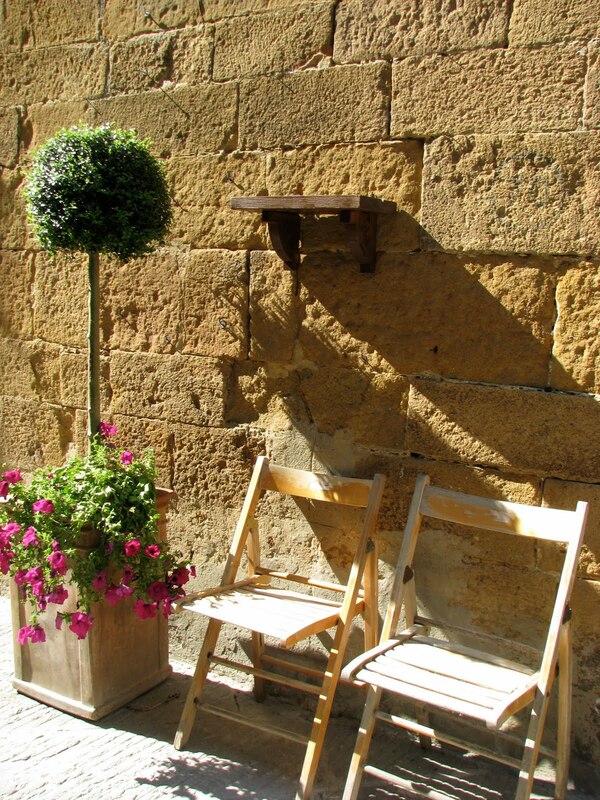 Montepulciano is a quaint wine town; quiet, inviting and beautiful. When I think of my family living in Sicilia, this how I pictured things. Below you will see one of the first places we visited as we walked up into the city. Do you see the name above the door? Ok, so it says "Cacciatori" and my family name is "Cacciatore", but it was exciting! I took a lot of pictures of doors on this trip. So many beautiful wood doors with unique looking knockers lurking on every street. Matt and I walked around Montelpulciano for a spell and then settled into the outdoor cafe in the town piazza. They were playing the World Cup match of the day (England was slaughtered by Germany!) on a big screen. As I'd mentioned prior, it was fun to be in Italy during the World Cup and be amidst people who respect soccer as much as Matt and I do. The weather was mild, the house wine was tasty and they kept bringing us snacks. Pretty heavenly! Before heading back for the night we found a little place to eat with inexpensive wine and enticing looking antipasto. Matt (who is allergic to pork) indulged me and let me order a cured meat extravaganza. I have never seen cured, salted pork in so many different forms! Proscuitto, salami, a jerky of sorts, plus three other porkie products I'd never even seen before. Amazing! We struck up a conversation with the owners of the restaurant, a friendly husband and wife. It turns out that the husband is originally from Sicily and his last name is Torrisi. (The mom of my soon to be stepson Jack is a Torrisi. Small world!) The Torrisi's told us how much they'd like to live in the US and we told them about how much we'd like to live like they do in Tuscany. The grass is always greener I suppose. I leave you with a shot taken from outside our villa at Podere Poderruccio. 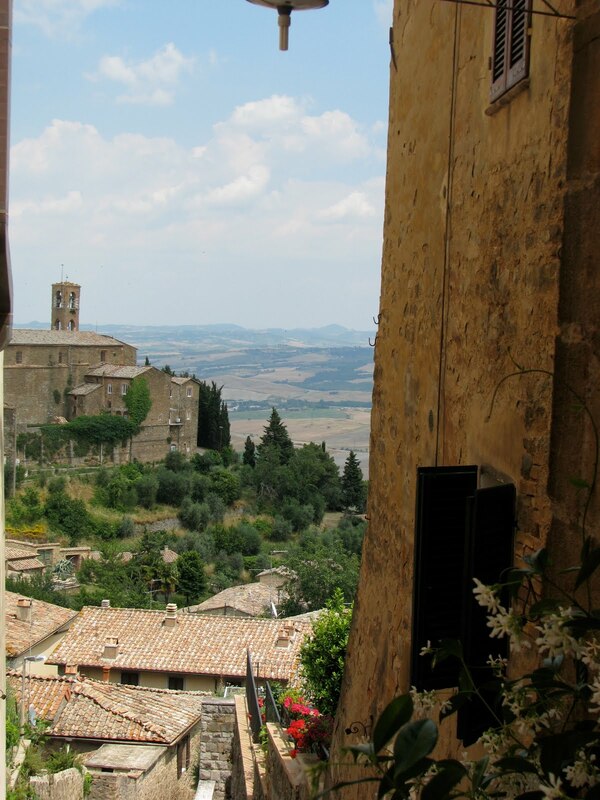 There's nothing quite like the Tuscan countryside. I promise that I will finish up my Italian travelogue in the coming week. Last stop: Roma. Hey Jen, you are a great writer..and also some great pics..I wish I was with you guys. How can I find part 1 & 2..I missed them.